Doug Mitchell was born in Harrow, England, a country where football means quite a different game, but Mitchell quickly mastered the Canadian version of football. Mitchell played college ball at Western Ontario and then went on to an eight year career (1967-74) in the CFL. Mitchell played his entire career in Hamilton with the exception of his last season where he started the year with the Tiger-Cats and finished it with the Alouettes. Mitchell played center and also handled most of the kickoff duties for the Tiger-Cats during his career. 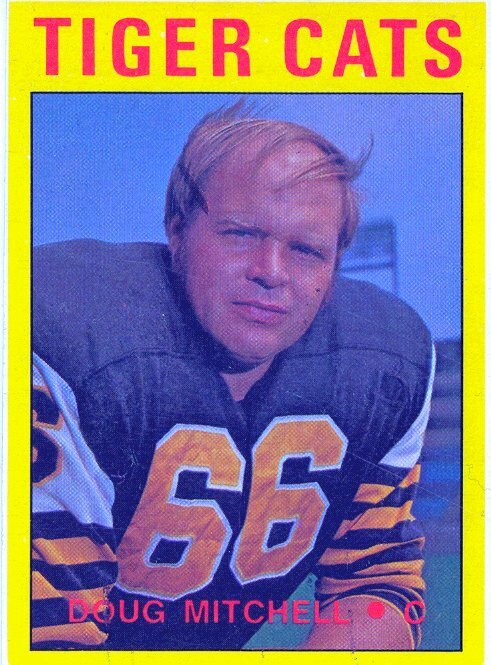 Mitchel was with the Hamilton Tiger-Cats when the won the Grey Cup in his rookie season in 1967 and again in 1972. Doug's older brother Bill Mitchell also played in the CFL, with Toronto, Edmonton and BC.